Howard Hughes, seeking a faster and more powerful plane that TWA's Boeing Stratoliner for trans-continental travel, turned to Lockheed Aircraft. The result was the record breaking Constellation, the plane that rewrote aviation history, helping make possible the explosive growth of commercial air travel. 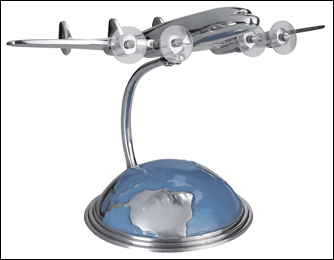 The sleek classic design was translated into a promotional item, at home on the desk of every travel agent, back when they were the ones who made your air travel plans. place in your home or office. 10-1/2" wing spread, 7" high.